I have had fond memories of this brand as my mum is a big fan of their pastries. During my growing up years, my mum and I will frequent Delifrance for their breakfast selections. Personally, I am a fan of their flaky, buttery croissants, potato gratin, fruit tarts and coffee éclairs. And just in case you didn’t know, Delifrance Singapore is a French café chain acquired by Auric in 2007. The brand also has over 30 years (wow!) of presence in Singapore and there are 18 café-bakery outlets in Singapore island wide. Launched on 9 November, the Delifrance 2018 Christmas Menu has a variety of log cakes, roasts options and mini delights that I urge you to try. If you are planning an upcoming gathering, fret no more, as their extensive menu definitely would bring a lot of convenience for you. You can be assured that they have everything you need/want for a perfect Christmas Menu! P.S. Read on to find out how to be entitled for a 15% discount for Delifrance’s Christmas Menu 2018! The highlight of the night has got to be Delifrance’s best seller, Joy of Delifrance (1.2kg, $68) log cake. For chocolate lovers, this is MUST-TRY! It’s basically a sweet Valrhona chocolate encased in velvety chocolate cake, so so good that I took a second serving (even though I was on a diet and clearly my waistline is exploding). The chocolate sponge was soft and it managed to stay clear of being overly rich (or jelat). It is so classic, simple and yummy. If you don’t like chocolate, you should still try the Joy of Delifrance because it is so freaking delicious haha. Otherwise, you can try the 1kg Chocolate Crumbs and Cream Cheese Log Cake ($60) that is made with cookie crumbs, cream cheese and layers or light sponge cake. It surely tastes as gooood as it sounds too. I also enjoyed both the Traditional Roasted Turkey (4.5kg, $128) and Honey Glazed Chicken Ham (2kg, $58). Because what’s a Christmas celebration without turkey and ham? Who agrees with me? :p Delifrance’s Roasted Turkey is stuffed with flavourful chestnut and marinated with chef’s special sauce. And it comes with savoury brown sauce and cranberry sauce. At such an affordable price tag, Delifrance Roasted Turkey is worth every single dollar. The ham is succulent and baked to golden perfection. Brushed with a delightful layer of sweet honey, it’s tasty and has a lovely sweetness to it. And now onward to the most important question.. How to order?! 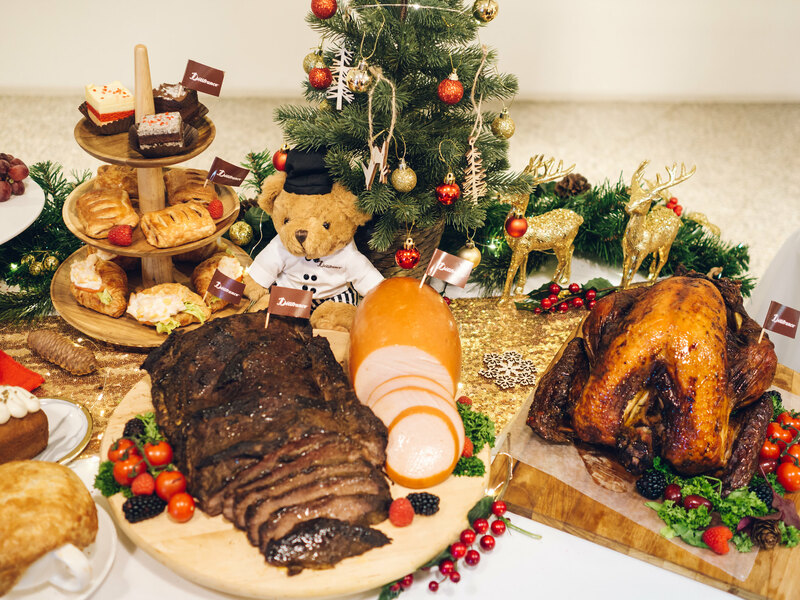 Visit https://www.delifrance.com.sg/order-online/christmas-menu to view the complete Christmas Menu. There’s a lot more goodies than what I have just mentioned above! And.. remember that orders need to be placed 4 working days in advance (before 1pm) from Monday to Friday (excluding Public Holidays). To enjoy the 15% special discount, all you have to do is to place your orders before 30 Nov 2018! Please don’t miss the additional discount, because it is super worth it. With that, let us countdown to Christmas together~ Hohoho! P.S. A special shoutout to Sample Store for organizing this and for having me.